Yeah! that's it , combat damage ............................................. We are of the same mind! Are you going to join us?..If so welcome! We won't tell if your under 50! I sit here wondering where the years have gone. Walking through Walmart last week the halloween and CHRISTMAS???? displays surprised me. the year 2019 is upon us gentlemen, I don't know why but it seems the year 2020 will be a turning point for me and I am a little anxious about it. Not much activity on this thread lately I can only guess many of us are a bit burned out on it, If so just drop short notes to say Hi YA so we know you are still with us. Still here, but I`ve done precious little flying this summer due to the fact that I just can`t handle the heat and humidity. Been living here in Tennessee for 15 years (a transplant from Maine), but have not become acclimated, in fact it seems I`m becoming less and less tolerant over the years. The Yankee blood runs deep and isn't thinning out. A little cooler last Saturday so I got a couple flights on my Tiger 60. It also seems the refresh rate or something has been slowed down on this site. I think I got a bit burned out this year. After crashing the Somethin Xtra due to an aileron failure, then the Rascal 168 due to a bad NiMh cell, I haven't flown since. In fact only RC thing I did was assemble the spare SSE with the guts from the crashed one. Haven't done a thing since. Too many around the house projects too, and the summer went by FAST! Well I finally made it to the workbench to try and straighten the banana out of my DR1 fuselage. I had to take the horizontal stab front mounting plate out so I could soak the wood down and clamp it in my building jig. I'll let it dry a couple of days and pray! I'm thinking of shelving the DR 1 and go back to the TF 182 or start something new. Something new is real tempting. I spoke to the scheduler Friday about my full knee replacement she tells me the hospital with the robot assistance is booked until after Thanksgiving. I think I'll wait for an opening. 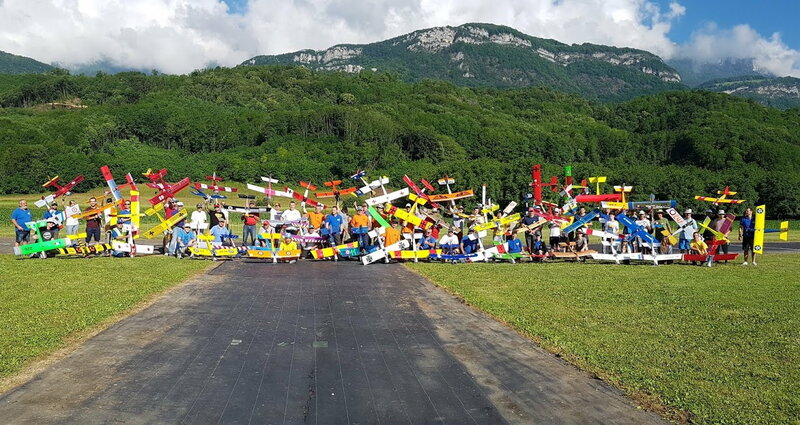 The sixty-eight competitors in La Coupe Des Barons, 2nd June 2018. The overall winner stands extreme right. Your humble servant stands about fifth from the right, No 247. 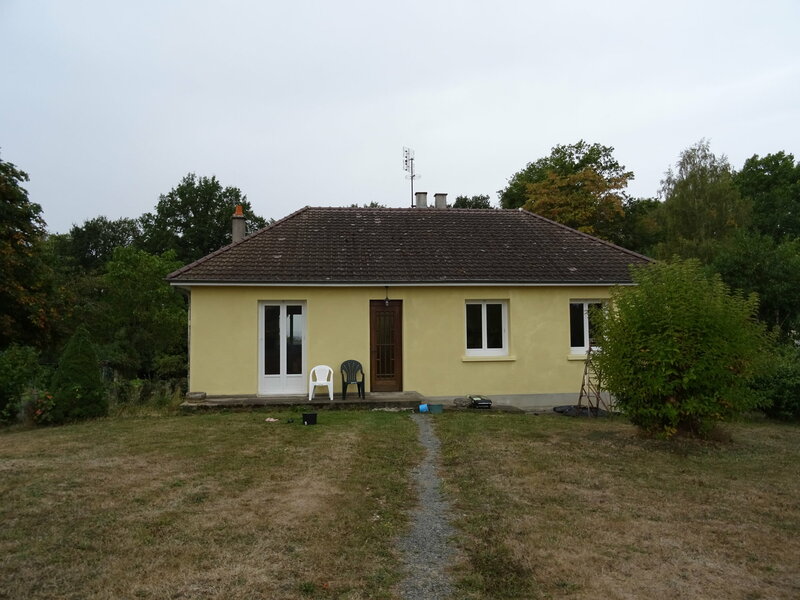 My house in yelow ochre. Welcome Shagdog and Johnnymax, hello everybody else! The weather has been pleasantly warm in Central France over the summer usually 25-30C. 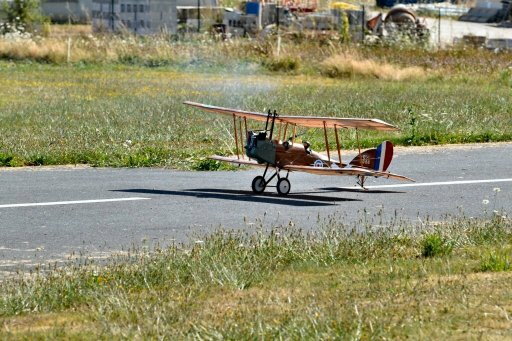 Regular contributors will know that I participated in my first model aeroplane competition on 2nd June, La Coupe Des Barons, since then it has rained on only seven days, so the vegetable garden hasn't done very well. For the benefit of newcomers to this thread I've attached a picture of the sixty-eight Coupe Des Barons competitors below. Well, I intended the pictures to appear below but they've ended up above. Never was any good with computers! This weather has been excellent for flying and for painting the outside of the house. I was surprised at just how yellow my colour choice has turned out. However, everybody likes it and the manageress of the local restaurant says it's ochre not yellow! I've attached a picture of the facade, after the first coat on the masonry. For some reason the cybernetics would not accept my "before" picture. I've really gone to town on the soffits and fascias. Wash, rinse, rub down, patch prime, patch undercoat, one coat of water-based undercoat, one of flat matt white solvent-based paint and one coat of white gloss. At seventy years of age I'm determined not to go through this process again in ten or fifteen years time! That said, I believe that the excercise involved in the activity has done me some good. Before I started my knees were giving me occasional gyp, now they're fine. I have finished the facade and one side of the house, the other side just requires a couple of days, then it'll be round to the rear of the building which faces south-south east so at these lattitudes it takes more weather. I expect I'll have to burn off all of the old paint from the fascia boards. Two of the blokes from the model aeroplane club have offered to loan me scaffold towers which will make the job easier but unless the next few weeks are dry, the back of the house will have to wait till next Spring. I still have to paint the shutters but that can be done in the garage. I'm torn between the simplicity of white and the contrast of a mid-to-dark green. It has rained overnight and further rainfall is forecast for later today which has probably put the mockers on any further painting or flying. On the aeromodelling front, I am finishing off a Baron kit for the Club Secretary, Gerard, who's an assembler of ARTFs not a builder. For this service he gave me a Radian electric-powered foamie glider complete with Spektrum receiver and LiPo to use as a basic trainer with ham-fisted, retired novices! I say finishing off, he gave me a slightly bananared fuselage and I used his kit's wing ribs to build "Boris," the model I entered into La Coupe Des Barons, (Russian WW1 colours!) So I've had to cut my own wing ribs and I wasn't able to buy strip-wood in exactly the same sizes as supplied in the kit so I had to improvise. 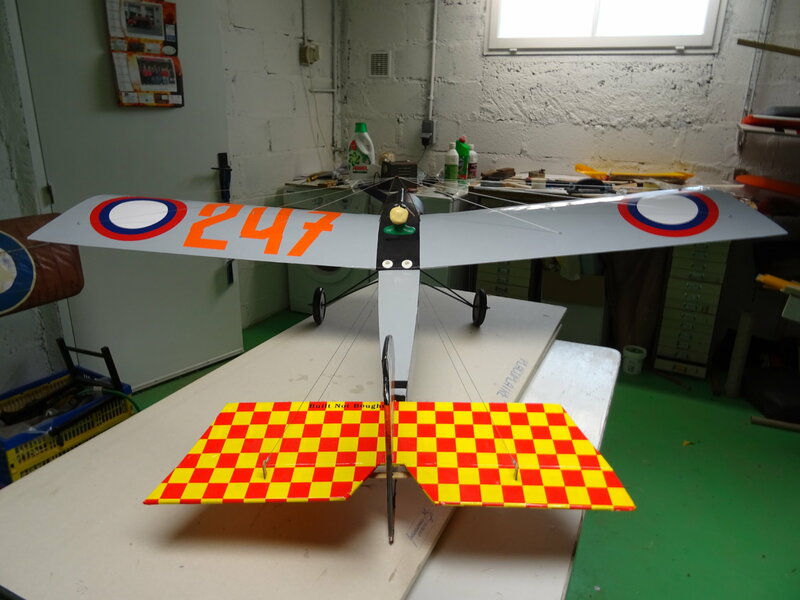 I have nearly finished the basic structure of the wing, but I will have to go over it carefully and get it to look as good as I can as Gerard has chosen to have the flying surfaces finished in transparent orange film so any imperfections will be more easily noticeable! If the rain which was forecast actually arrives I'll be able to devote a couple of hours to Gerard's model. I've been doing a fair bit of instructing with an expatriate Englishman and assorted French beginners if our French instructors are not available. This has improved my language skills, mostly bad language skills! I bought two Enya engines for a song on eBay recently, a ballraced 29 and a plain bearing 35. I've fitted the 29 into Boris. 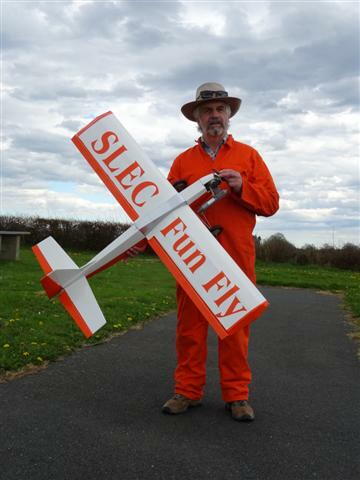 It flies it pleasantly but at no great speed and will probably re-install the SC32 and use Boris as a reserve model for next year's Coupe Des Barons. However, you can get a special prize if you use a period engine in the competition. I seem to have shamed several of my French clubmates into entering next year's Coupe and two of them intend to use period engines, a Merco 35 and another Enya 29. My Enya 35 turns out to be brand new, in its box, with the high compression cylinder head still in its plastic wrapper. Apparently it has been installed in a model, it has bolt marks on the mounting lugs, but it's never been started. I'm by no means an engine collector and these things were produced in their thousands so it's not valuable but I'm strangely reluctant to start it! I plan to build a lightweight Baron over the coming months for next year's competition and to build a Walt Good "Big Guff" as well. I'll keep you posted. Last edited by Telemaster Sales UK; 10-07-2018 at 04:25 AM. Many years ago I was loaned an Andrews H-Ray with an Enya 19 on it. That engine was a standard air-bleed bushing and it would run great on the ground but once it got airborne it would crap out. I have come a long way these days and I am somewhat a better engine tuner.I didn't really like that airplane it was beat up and oil soaked to the max and I ended up giving it back to my friend as I picked up an eaglet and that worked out better for me. Today I have collected about 12 airplanes and I am starting to run out of space for kits. I have one 2.4 Futaba radio and 6 rxs and I might add some more as I get these airplanes built over the next few years! A lot of people are unfamiliar with the air bleed carburetter and do not realise that the slow running needle controls the air, not the fuel, so to weaken the mixture you screw the needle outwards, to enrichen it, you screw it inwards. This type of carburetter was also used on the OS FP and LA range of engines and the OS FL 70 fourstroke. 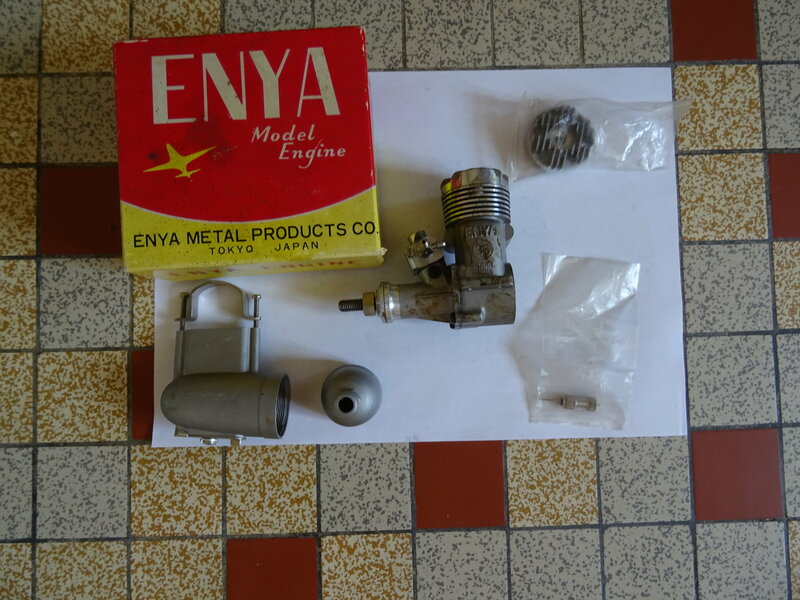 Most Enyas were fitted with this sort of carburetter but in the end even Enya went over to the more common twin needle carburetter. These engines were marketed as TN Enyas, TN standing for Twin Needle. I own seven Enyas: a brand new 15; a 19; the 29BB referred to above; the brand new 35; a 45; a 50; and a 120 FS. They all have airbleed carburetters, so does the OS 40FP in my SLEC Fun Fly and the OS FL 70 in my BE2e. I have found that once set you do not have to adjust them again. On the other hand, Enya engines, take an absolute age to run-in. Perhaps that was the reason for the erratic performance of your Enya Michael. I'm told that it has something to do with with their cast iron pistons in cast iron bores. I'm not looking forward to running in either of my new Enyas. One more reason for leaving the 35 safe and sound in its box. I'm toying with the idea of setting up a group called "Iron In The Soul" for admirers of Enya engines, but perhaps that's just too fancifull. Admirers of the work of Jean Paul Sartre will know what I'm talking about! I remember when we were youngsters in the late 60's and flew control line models most of us had Fox 35's for bigger motors and I went and bought an Enya 35. That was the most miserable motor I have ever broken in. We had a gear driven electric starter and the Enya broke it. We started calling them "Hemorrhoid motors". Terrible things to break in but I still have a couple 35's and a 45 and they are still running fine 40+ years later. The Enya air bleed carb definitely required a magicians touch to get right even on their helicopter carbs. They were very different from the OS air bleed carbs for sure. I see some new names ............... johnnymax..................... stickslammer....................Red head..................Shagdogjr................... .Mkjohston...........................Mad Man Marko. and I hope to see them more often, we enjoy new company. WELCOME! This is the place where you can share your memories for us to enjoy with you, again WELCOME! Telemaster.... you fired some memories with the description of the Enya CARB. It took a bit of patients with the needles to get them set up but it paid off once the piston and sleeve mated up. Cast metal does require a longer break in period and the new generation flyers with a old engine get in trouble using the synthetic fuels of today to do the job. I followed what Duke "FOX" recommended.. Castor oil fuel and plenty of it because it not only lubed but carried away the metal filings of breakin and heat. my first runs were accomplished with castor fuel and the engine blubbering and spitting excess fuel all over the place, at least three four ounce tank full before increasing the rpms. When I followed his advice It resulted in a long lasting fine running machine. I broke in my fox 35 R/C engine in 1958 and currently have it in a nobler. A good engine regardless of brand will last! Hi guys, Something must have happened to my E-mail I haven't been getting the links to us last few weeks I just noticed it.I have been trying to get my self accustom to flying control line with out getting to dizzy. earlier this summer I flew my Ringmaster with a New K&B .28 I was shocked at how fast it was. I fell down and tried to keep doing figure 8s laying on the ground didn't come out well. I have another Ringmaster with a Torpedo.19, some one gave the enginet to me 60+ years ago. It flys slower and with a really small tank only runs about 3 minutes. So I fly it about 6 or more times in a row for last week. Now I don't feel dizzy at all. So I am thinking about try to fly my Chief. Last edited by Joe Fisher; 10-08-2018 at 01:39 PM. Donny, you mention earlier that you thought people were burning out on this thread. I started looking this morning at the 5 forums I subscribe to. They are "Kit Building", "RC Scale Aircraft", "Scratch Building, Aircraft Design 3D/CAD", "Golden Age, Vintage and Antique RC", and "RC Warbirds and Warplanes".Of those 5 one had and update today, one was updated yesterday, one on 10/7 an two on 10/5. I am starting to think its RCU as a whole. From what I can see things aren't any better at RC Groups or RCMF (UK forum). On Face book there is Built not bought R/C aircraft no ARFs or Quads. These guys are doing some real amazing stuff. Telemaster is on there too. That's right. Check out the tailplane on the Baron! I needed to make a quick trip to Kissimmee, Florida and back. I left on Saturday. Little did I know that Hurricane Michael was forming in the gulf. On Sunday or Monday a friend informed me of Michael. No time to make an early return. Thankfully it did not turn towards central Florida. Now I have to wait for road and fuel reports before attempting a return home. I have to cross Michael’s path on the way home. Hopefully in a few days. Looks like a lot of destruction. Prayers to all affected by Michael. October marks the one year mark on my current airplane build. It is about ready to cover. Things just keep getting in the way of this build. My longest scratch build so far. I hope you brought something to fly! I have a feeling you are going to have a bit of a wait before they let people back into the area of the path.